Dry Eyes? Dry Mouth? Fatigue? Joint Pain? Increase awareness of a common women's autoimmune disease and support research into new treatments and a cure. 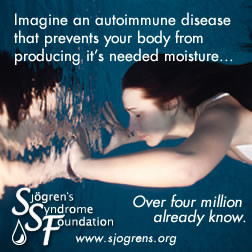 With 4 million Americans suffering from Sj_gren's (upwards of 75% yet to be diagnosed), it is so important that we understand the seriousness of Sj_gren's and why patients need to be diagnosed. Lynne is a 36 year old patient and mother of two children, awaiting a double-lung transplant because her Sj_gren's caused interstitial lung disease a complication that can occur in Sj_gren's patients. Due to her deteriorating condition, Lynne chose the lung transplant as her last option as there is nothing more the doctors can do for her Sj_gren's or lung issues. This is one of the many complications that Sj_gren's patients fear of developing. Fran is a 55 year old woman who was diagnosed with Sj_gren's ten years ago and developed non-Hodgkin's lymphoma three years ago. As a Sj_gren's patient, Fran knew she had a much higher chance (44 fold) of developing non-Hodgkin's lymphoma than a healthy individual and had been regularly monitored by her physician for the onset of lymphoma. Fran is now in remission from her lymphoma, however, she knows that some patients are not as lucky. This is especially true for those who have yet to be diagnosed with Sj_gren's and thus do not know of their higher risk of developing lymphoma. Getting a diagnosis is critical so a patient can be monitored for serious side effects and complications. Victoria is a 38 year old woman who became disabled from Sj_gren's and had to resign from a career she loved - being a photo-journalist. She was later advised by her physicians to not have children as her life may be at risk due to pregnancy. She learned that babies of Sj_gren's patients have an elevated risk of being born with fetal heart block.